Are you getting ready for Christmas yet? Surprise your family and friends with some of these vegan Christmas cookies! They’re all pretty easy to make and some of them are even low in sugar and gluten-free! I absolutely LOVE Christmas baking! It reminds me so much of my childhood. And this year my Christmas mood actually started pretty early! So I teamed up with some fellow foodies and put together a huge roundup of vegan Christmas cookies. I just wanna try all of these vegan cookies at once! Don’t they look absolutely delicious?! We’ve got you covered with all kinds of vegan Christmas cookies. And if that’s not enough you can check out the virtual Holiday cookie party I had with some fellow vegan food bloggers three years ago. If you’re looking for more vegan Christmas recipes, I’ve got you covered with festive vegan mains, appetizers, desserts, and even Christmas drinks! It’s the most magical time of the year and vegans definitely don’t have to miss out on the delicious Christmas feast. So let’s get the vegan baking started! 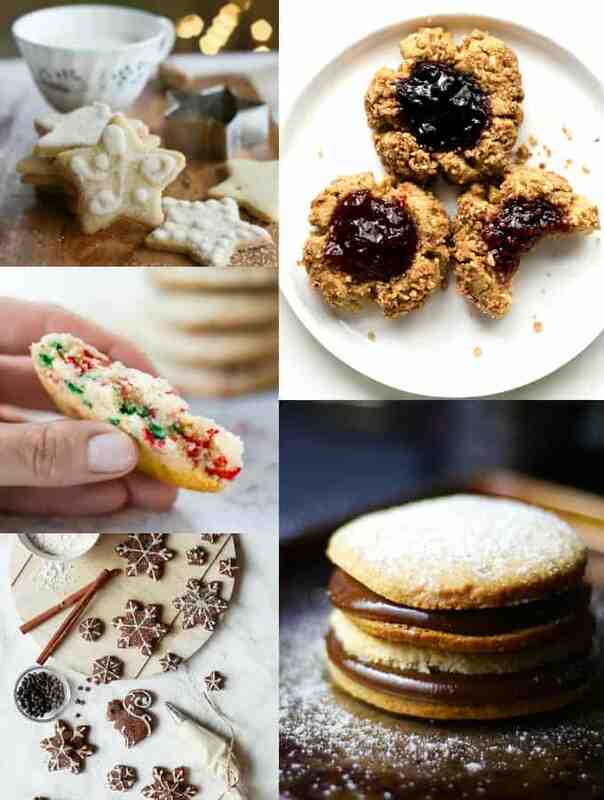 25 Amazing Vegan Christmas Cookies You Have to Try This Year! 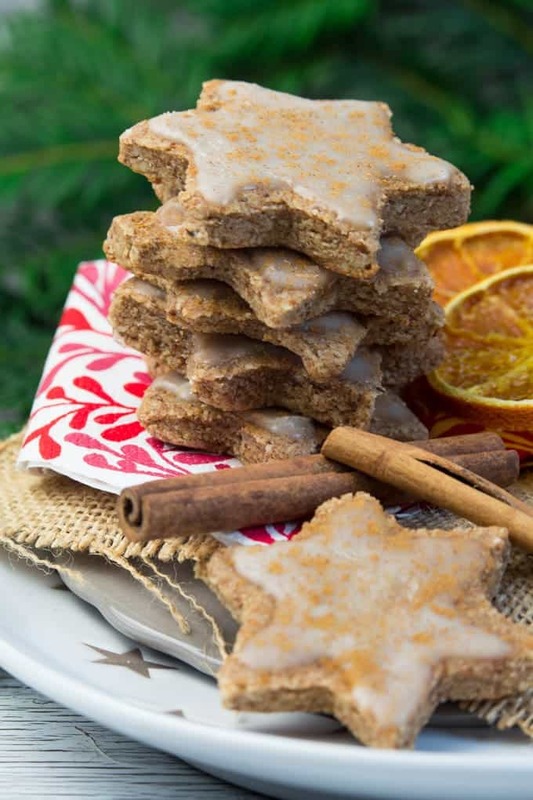 These vegan orange cinnamon Christmas cookies have been one of my favorites for years! They’re extremely easy to make, packed with flavor and nutrients, and sooo delicious! Oh, and let me tell you there is a lot of cinnamon involved. 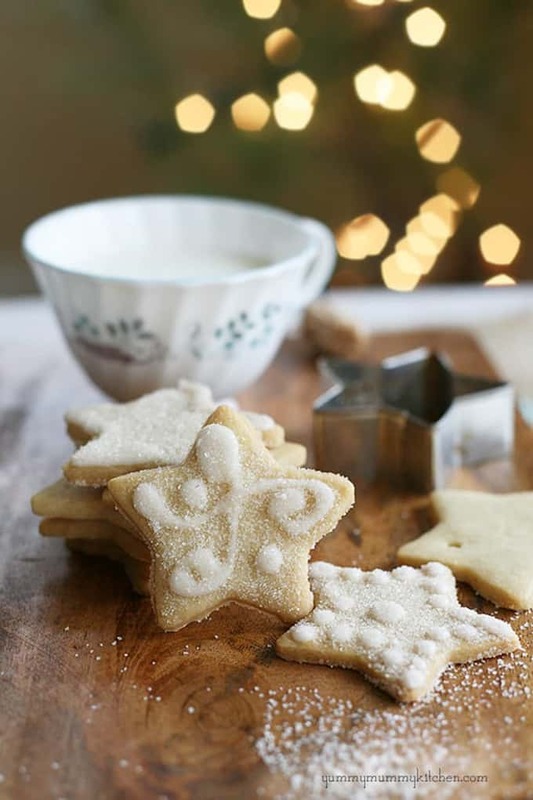 These vegan sugar cookies by Marina from Yummy Mummy Kitchen made with coconut oil. 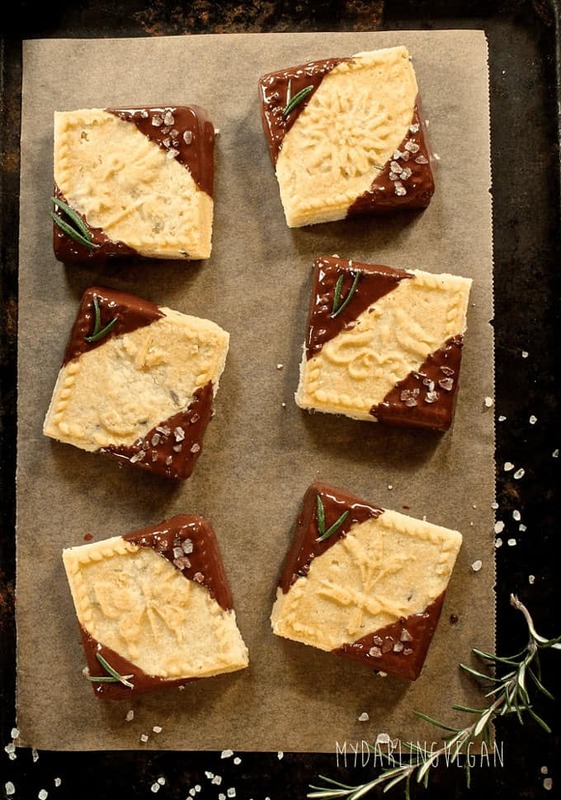 They’re are perfect for cut-outs and the recipe couldn’t be easier! 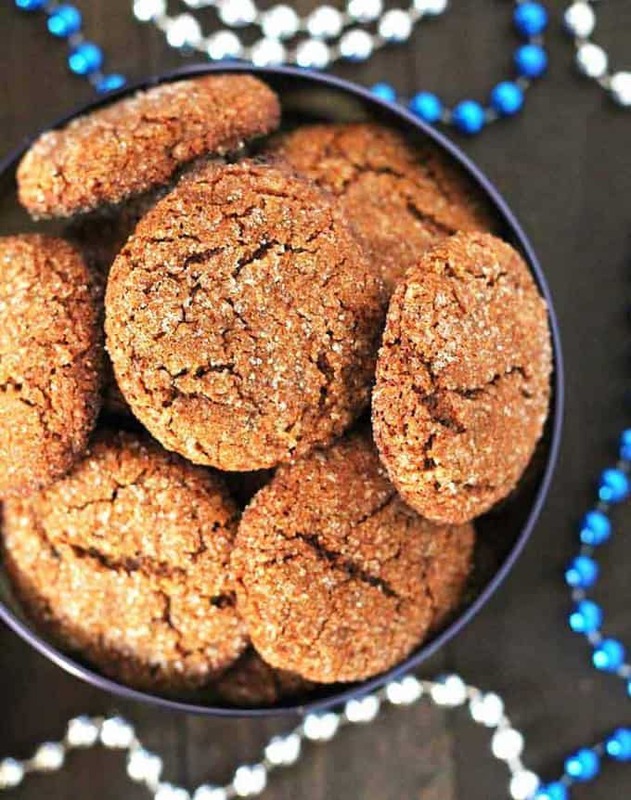 These vegan gingersnaps by Brandi from The Vegan 8 are perfectly sweetened and spicy! Brandi used coconut butter to give them an extra dose of sweetness, flavor and buttery-ness. 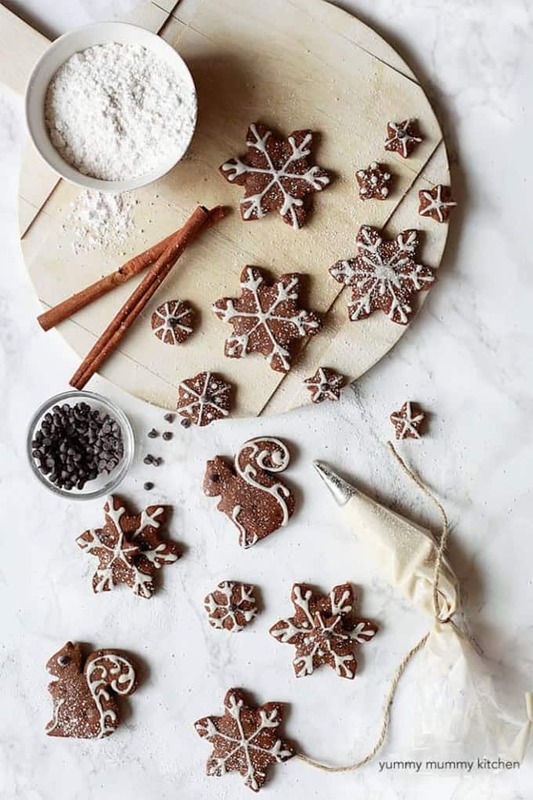 Don’t these perfect vegan gingerbread cookies by Marina from Yummy Mummy Kitchen look super cute? They’re perfect for decorating! Marina used coconut oil and wholesome ingredients for these cookies. 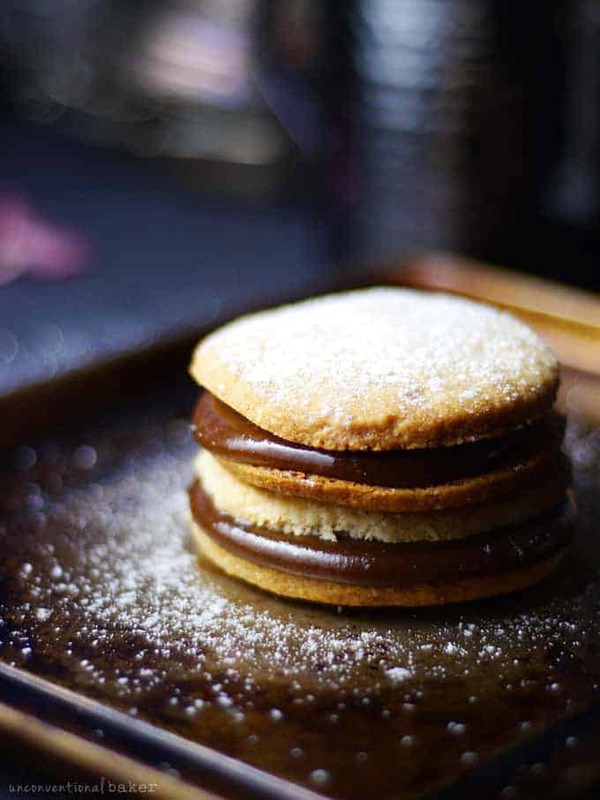 I just want to grab one of these melt-in-your-mouth Alfajores cookies by Audrey from Unconventional Baker from the screen. 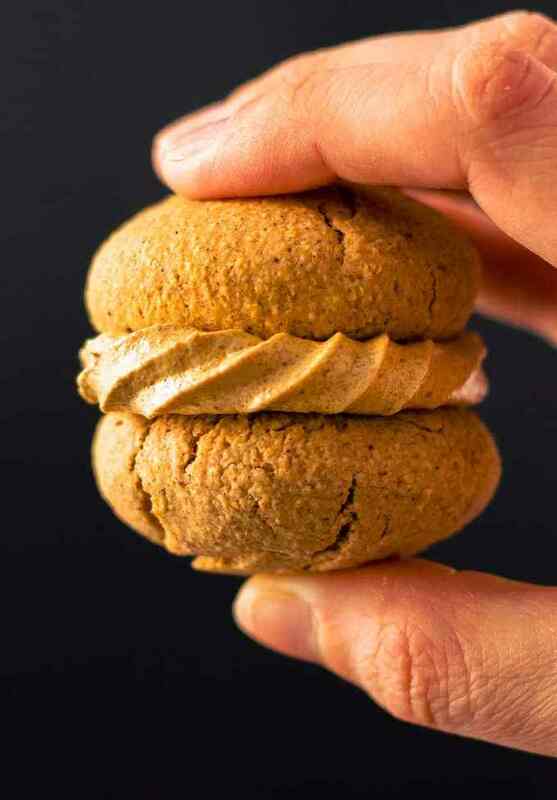 This soft gluten-free cookie sandwich is filled with gooey vegan caramel. And don’t forget to dust them with powdered white sugar. These vegan sugar cookies by Natasha from Salt and Lavender are super soft, easy to make, and require no chilling! 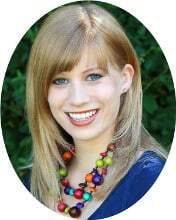 Natasha included several fun ideas on how to customize your vegan sugar cookies. 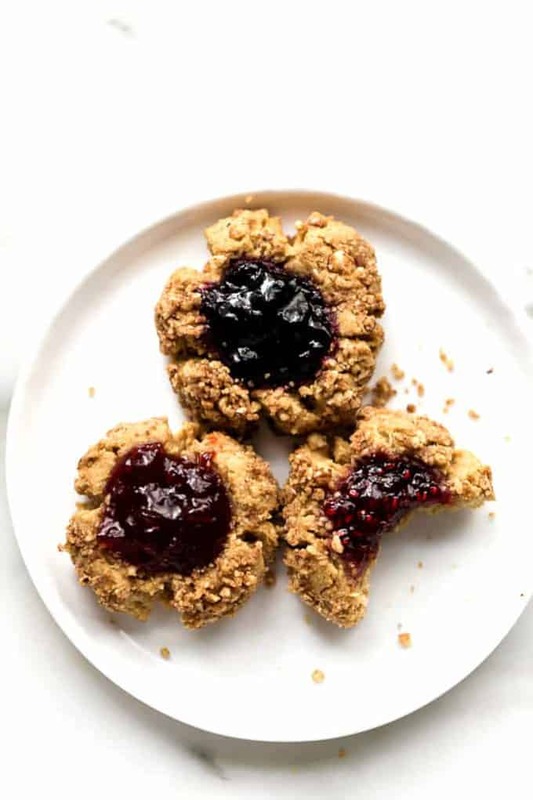 These thumbprint cookies by Ashley from Blissful Basil are the perfect vegan Christmas cookies. They’re made with oat and coconut flour and they’re filled with fruit spread. And they’re not only vegan but also gluten-free! Don’t these vegan sugar cookies by Brandi from The Vegan look super delicious? They’re gluten-free and Brandi didn’t use any butter or oil for this recipe. Soft, chewy, and perfectly sweet! These almond crescent cookies by Audrey from Unconventional Baker are super simple and come together in just minutes. 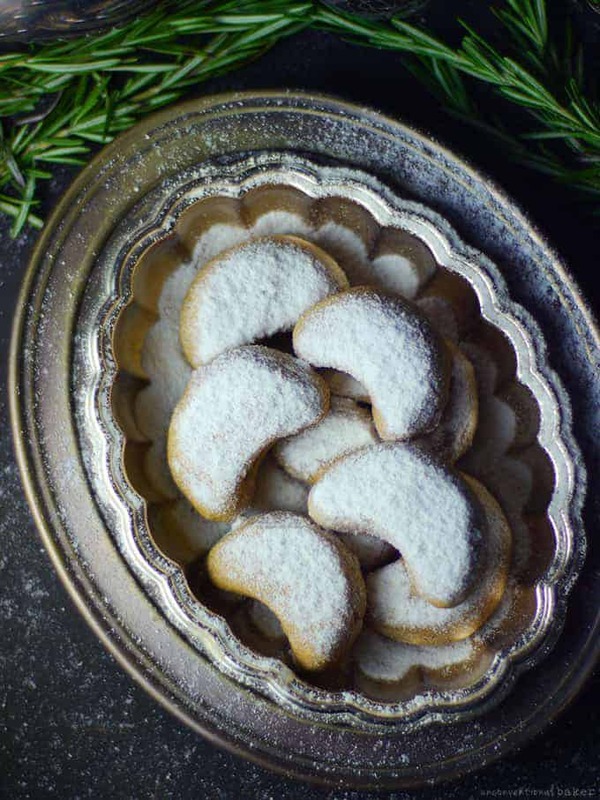 Audrey provided you with a gluten and dairy-free recipe for traditional holiday almond crescent cookies. These vegan apple pie protein cookies by Gabriel from One Clever Chef are super healthy and refined sugar-free. And their intense caramel apple pie taste is just perfect for Christmas! Besides, they’re also gluten-free and nut-free. 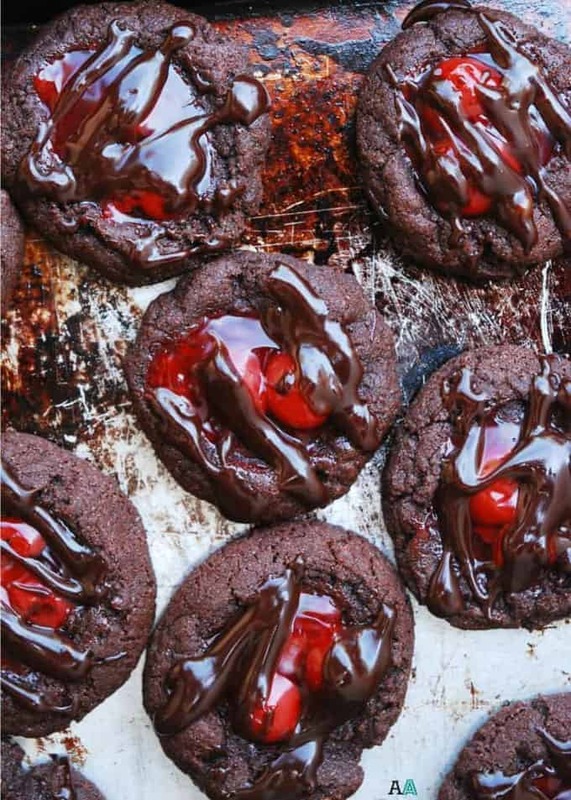 These chocolate cookies with a pool of cherry pie filling by Megan from Allergy Awesomeness look so delicious! They’re vegan and gluten-free and just look a that extra chocolate drizzled on top! BIG yum! 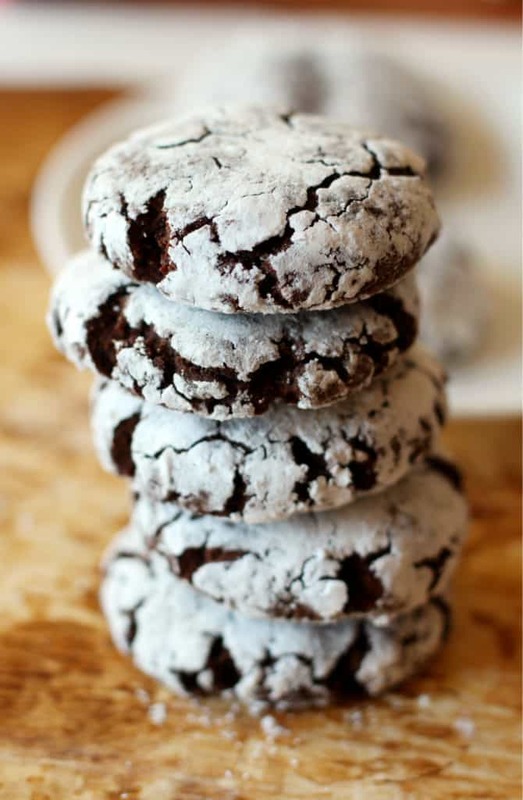 Rebecca from Strength and Sunshine added a minty twist on the holiday crinkle cookie with this recipe. The cookies are vegan, gluten-free, and perfect for kids! 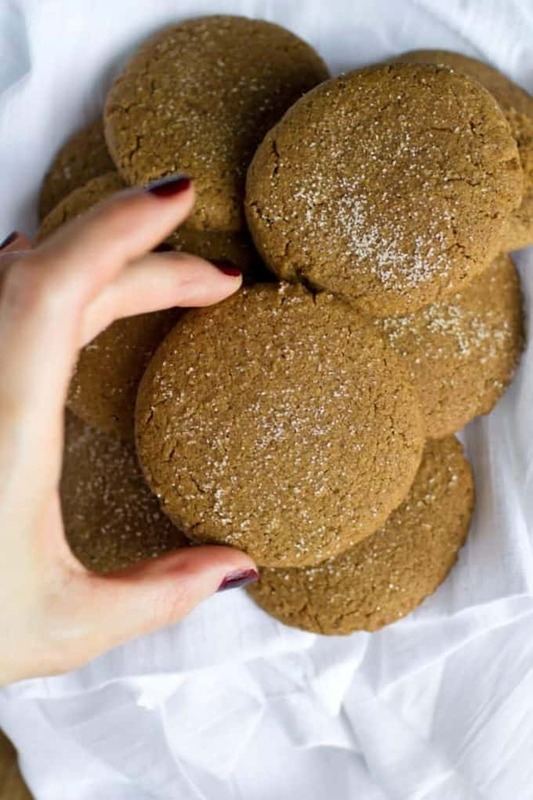 These vegan gingerbread cookies by Gwen from Delightful Adventures are chewy, perfectly spiced, and covered with sparkly sugar. 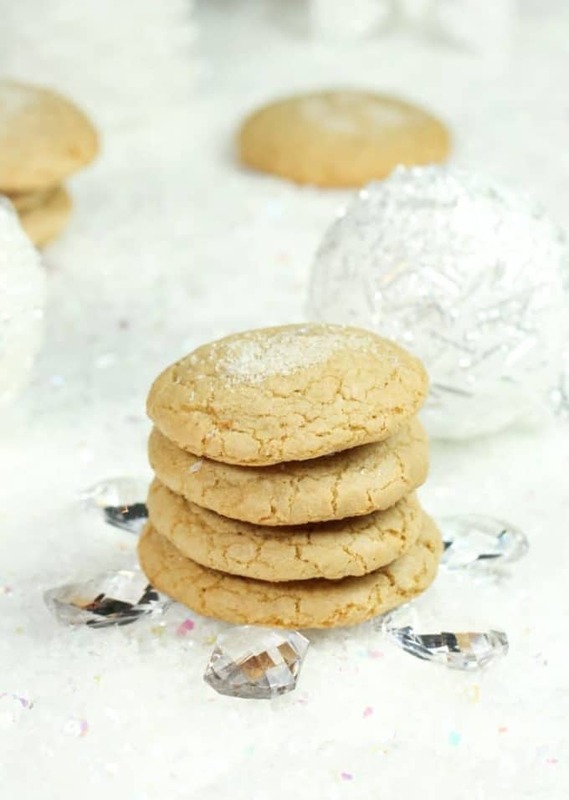 A great addition to your baking list of vegan Christmas cookies! 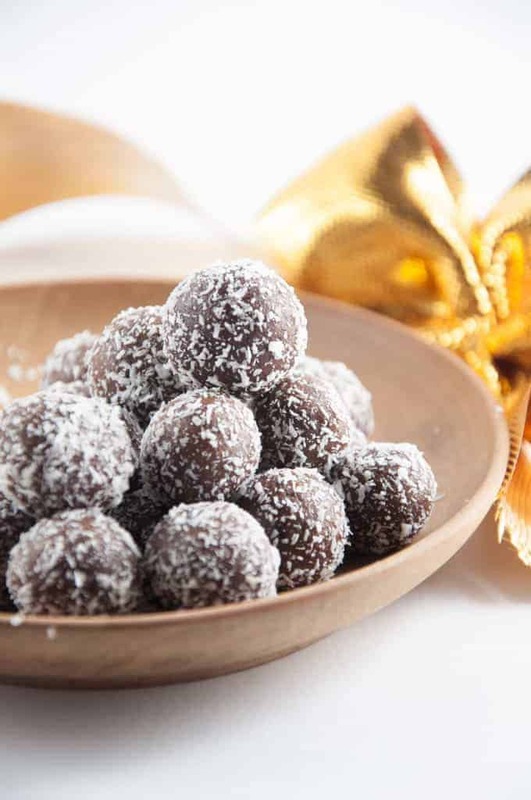 These vegan and gluten-free no-bake marzipan rum balls by Bianca from Elephantastic Vegan are perfect for the holidays. They’re super easy to make you don’t even need an oven for them. And the best thing is that they’re ready in just 10 minutes! 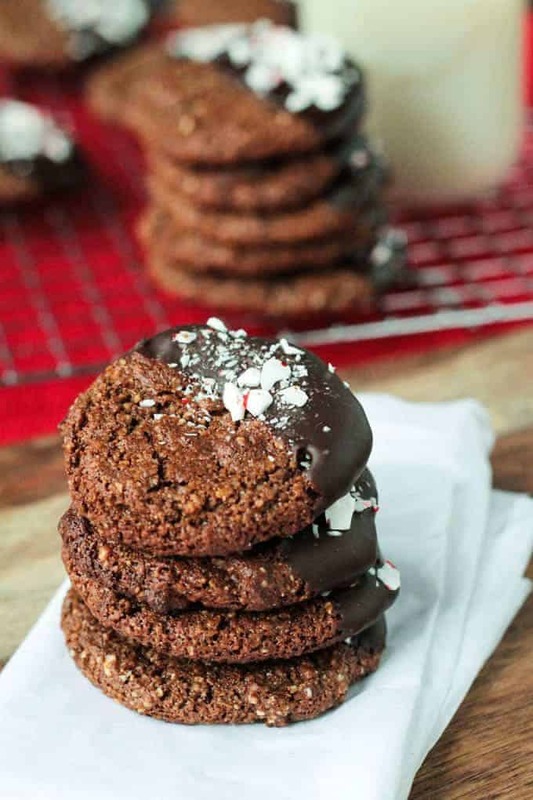 These chocolate gingerbread cookies by Jenn from Veggie Inspired are crispy on the outside and perfectly chewy on the inside. And the best thing is that they’re healthy! So you can go ahead and eat more than one! 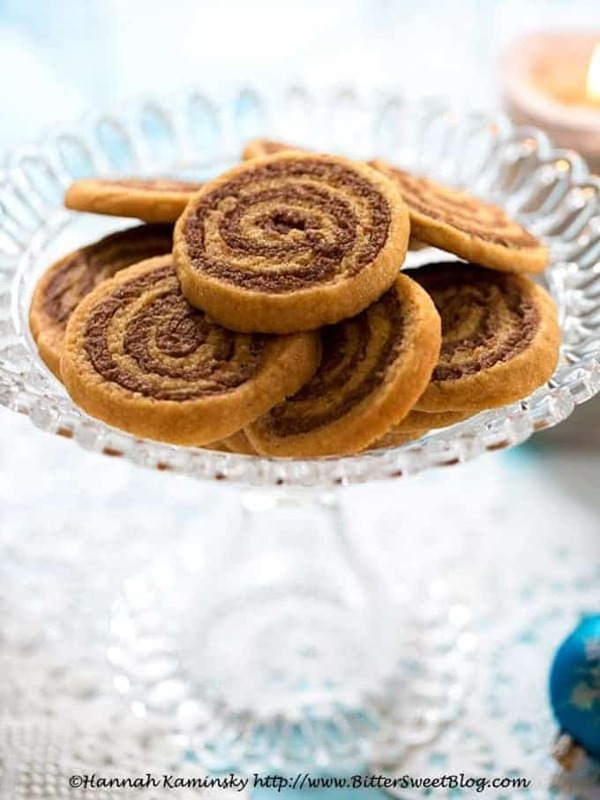 These cookie butter pinwheel cookies by Alisa from Go Dairy Free are made with Speculoos spread. It’s also know as “cookie butter” and it’s super yummy. If you haven’t tried it, you should really give it a try! 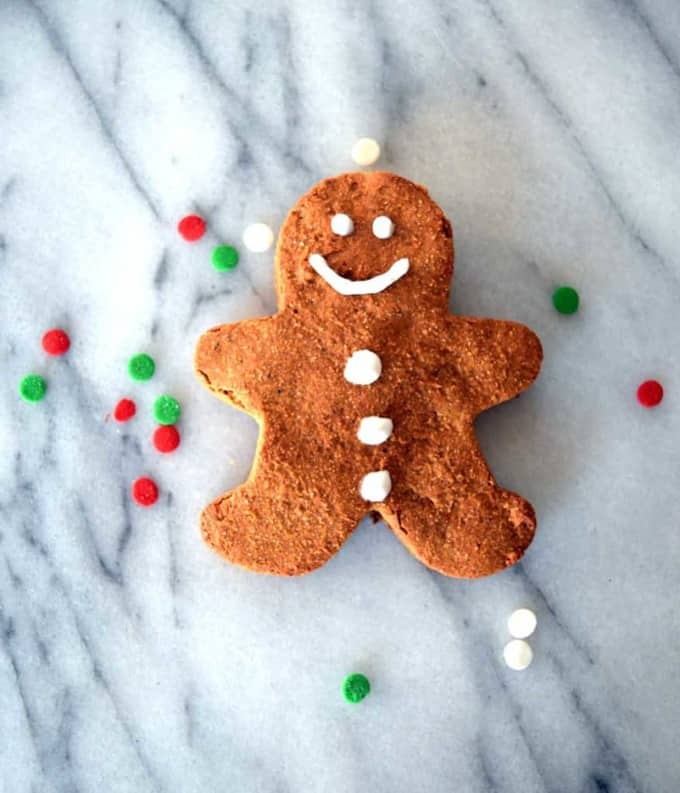 Don’t these vegan gingerbread men by Sara from Beaming Banana look super cute? 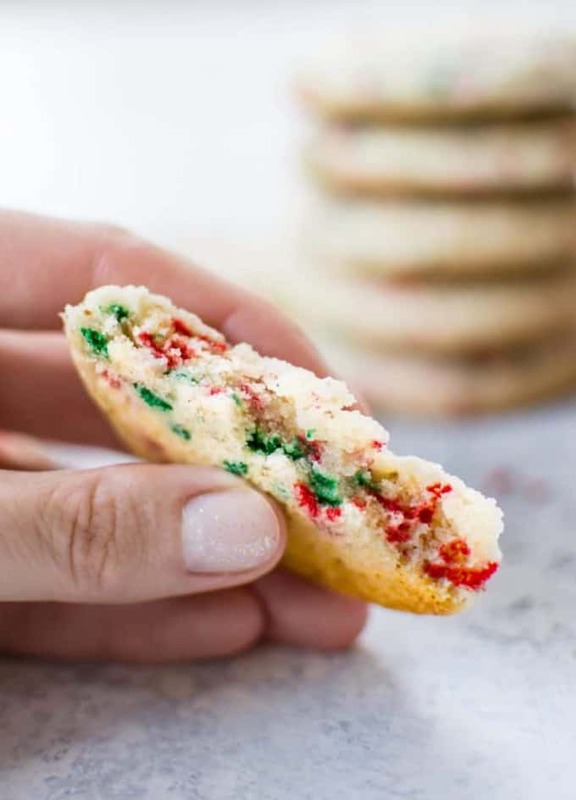 They recipe is a healthy and gluten-free twist on the most classic Christmas cookies. Instead of icing, Sara used unsweetened coconut cream to decorate her gingerbread men. These vegan shortbread cookies by Sarah from My Darling Vegan are super buttery and flaky. They’re dipped in chocolate and sprinkled with Himalayan sea salt. 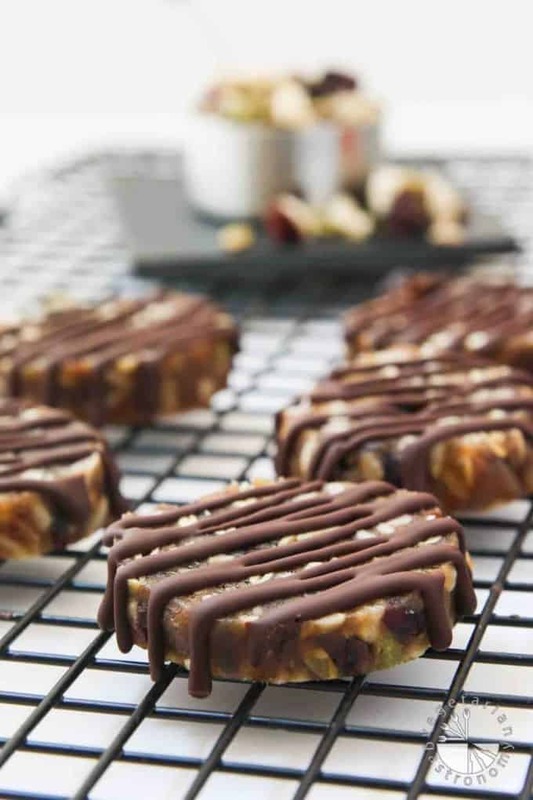 What a great twist on this classic cookie! Lebkuchen, traditional German spice cookies, are very common around Christmas. They are a bit like gingerbread and Alexandra from Occasionally Eggs made a delicious vegan version. And she drizzled some extra chocolate on top. Perfect for the holidays! 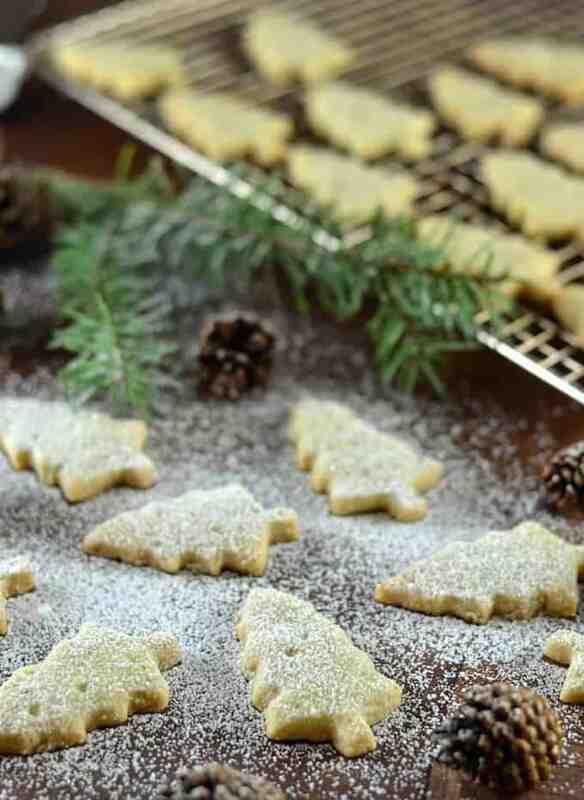 These vegan pine needle shortbread cookies by Melanie from A Virtual Vegan will melt in your mouth. They have just a hint of piney and citrusy flavor. Delicate and delicious! These oatmeal date and pecan cookies by Amanda from My Goodness Kitchen make healthy and delicious vegan Christmas cookies! Top them with some melted chocolate if you’d like! 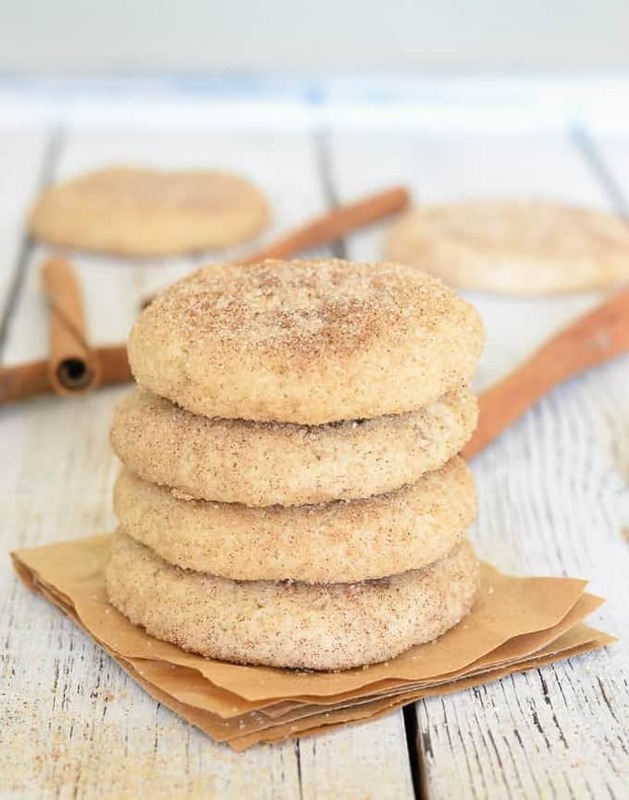 These vegan snickerdoodles by Melanie from A Virtual Vegan require just a few simple ingredients and no oil. They come together in under 25 minutes are soft-baked and buttery. 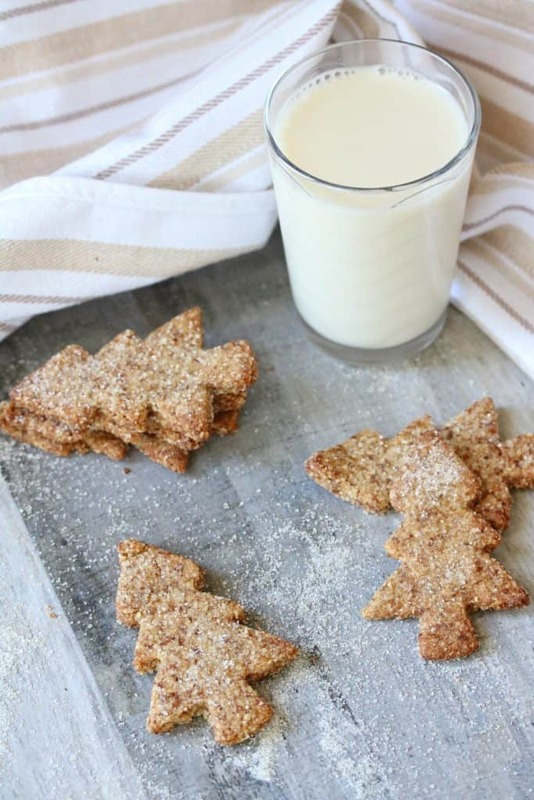 These crispy and chewy biscotti cookies by Linda from Veganosity are perfect for the holidays! Linda added cranberries and pistachios to her biscotti cookies, which is the perfect combination for Christmas! These almond flour sugar cookies by Shelby from Fit As A Mama Bear are thin, tasty and easy to make. Besides, they’re also gluten-free and vegan and you only need minimal ingredients. They’re perfect to make with kids! 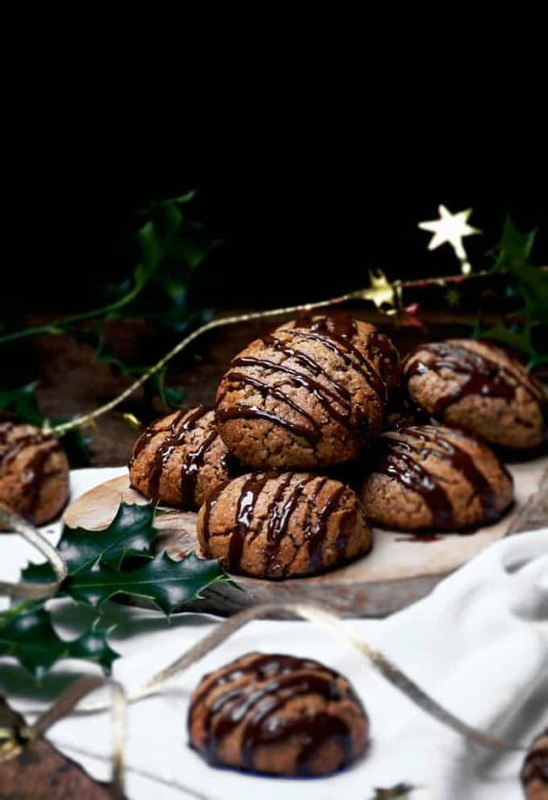 You don’t even need an oven for these chewy chocolate date cookies by Anjali from Vegetarian Gastronomy. 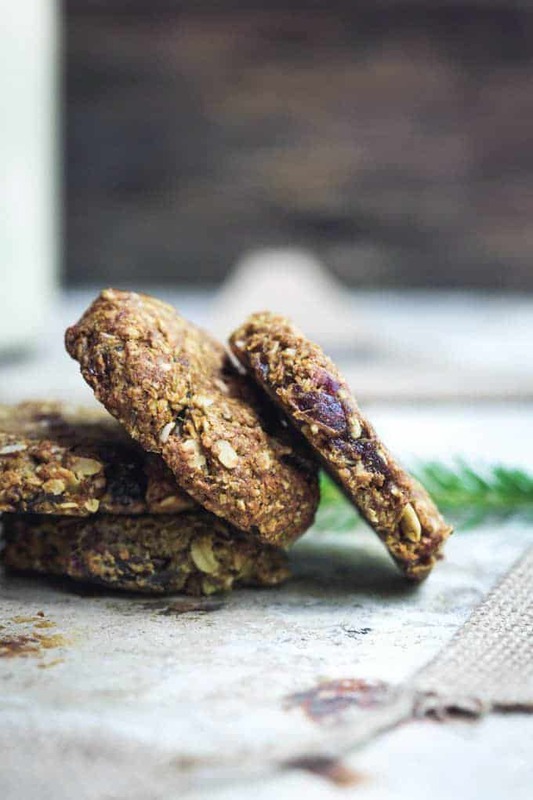 Anjali used dried fruits and seeds for these cookies, so they’re a natural energy booster! I hope you enjoy these vegan Christmas cookies as much as I do! 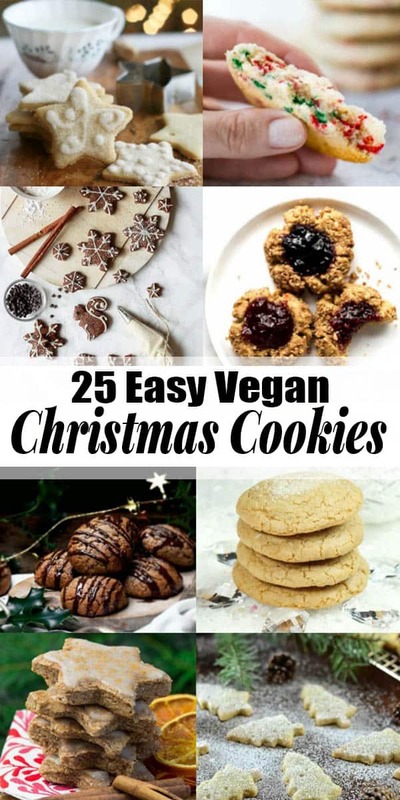 Don’t forget to pin or share this post so you have these vegan cookie recipes ready when you need them! Happy baking! If you give any of these vegan Christmas cookies a try, I’d love to know what you think about it. Just leave me a comment below. Your comments really make my day! « Mulled Wine – Super Simple Recipe! Bring on the Christmas Cookies! My kids and I have already been discussing which ones we are going to make for Santa this year. They all want something different of course – three batches of yummy cookies coming right up! These all look so delicious! Thank you for including my Chocolate Gingerbread Cookies! This gorgeous collection of Christmas cookies totally put me in the mood to bake! 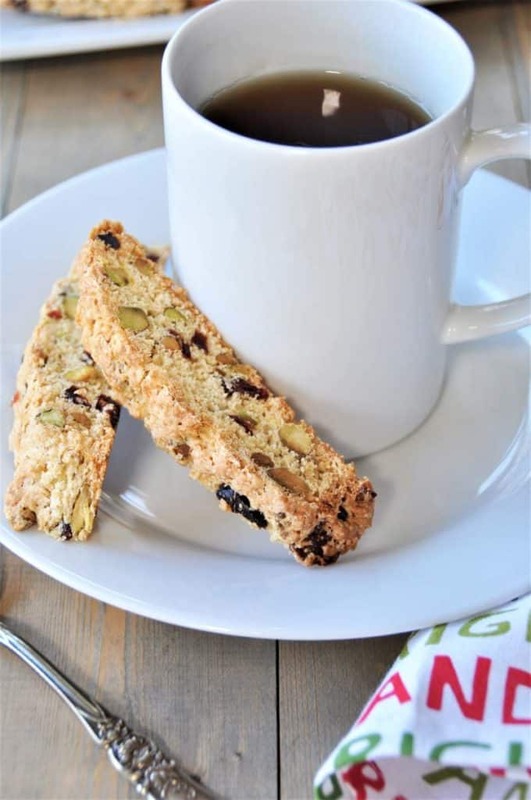 Thank you for including our Biscotti!